Awards ceremonies encourage the most prominent civil society leaders and events of 2016. DisRight Office's study: only one-fifth of tourist attractions in Minsk is fully accessible for disabled. Advertising of underwear sparks the feminist debate. Situation in Belarus still frozen, human rights defenders say. Almost 5 tonnes of clothing collected by UberGIVING campaign. APB BirdLife launches a wolf blog. MFA Head meets with Baćkaŭščyna NGO. Civil society awards. In the end of December, several awards ceremonies took place to encourage the most prominent civil society leaders and events of 2016. Belarusian human rights community awarded its annual National prize. A newly-established award Zrabili!/Done! found the most effective community activists. On 17 December, the youth RADA Awards ceremony was held. On 23 December, the Assembly of NGOs for the eighth time delivered its Civil Society Champions Award. Top 10 projects of Belarusian crowdfunding. Nasha Niva newspaper rates Top 10 of the most successful crowdfunding projects. The record year is $35,000 collected for seriously ill children with special needs, due to a sensational story in Imena magazine. Along with charity projects, crowdfunding campaigns to publish books or CDs, release games, improve the urban infrastructure were also successful in raising funds. Bright People of 2016. Naša Niva newspaper composed a list of the most visible people and events of 2016. 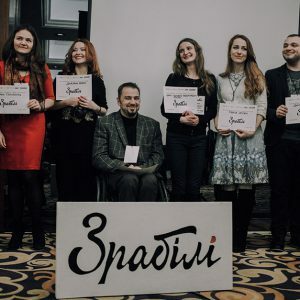 The Persona of the Year is named Kaciaryna Siniuk, the founder of Imena magazine, which collects money for people in need, the disabled, and orphans. Public activist of the Year is Andrej Kim, who translates foreign films in Belarusian and organises their screenings in the city cinemas. Only one-fifth of tourist attractions in Minsk is fully accessible for disabled. The Office for the Rights of Persons with Disabilities presented the results of the study on the availability of tourism in Minsk. 68 tourist attractions were studied – 36 of them were rendered radically inaccessible, 12 were marked as accessible. The initiative aiming to make tourism accessible was launched in the spring of 2016. Feminist debates. Centre for promotion of women's rights Her Rights appealed to one of the profit companies with a demand to remove the advertising poster, where a woman in lingerie eats macaroni. The Centre believes that the ads is sexist and degrades women. The correspondence between the NGO and the company provoked heated discussions in social networks. 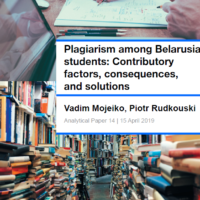 Watch DOCs Belarus. On 15-18 December, the Minsk venues CECH and TUT.by Gallery hosted the festival of documentary films on human rights Watch DOCs. This year the festival focused on such topics as youth struggle for life and dignity, a clash of East-West cultures, and people who are changing the world. A local NGO Zveno organised the festival that was supported entirely from local sources. Situation in Belarus still frozen, human rights defenders say. Certain positive changes have taken place in the sphere of human rights over the past year, but the problem of their protection is still relevant. For example, the number of persons punished this year for holding peaceful assemblies has tripled; fines of $300-500 are a strain on protesters’ incomes. Almost 5 tonnes of clothing collected by UberGIVING campaign. On 10 December, for eight hours, KaliLaska/You are Welcome fund and Uber taxi collected 4.7 tonnes of clothing from the residents of Minsk. Those who could not participate in the action can bring clothes anytime to KaliLaska fund that distributes the clothes to people in need. Social Boost Hackathon. During 48 hours non-stop (on 16-18 December) Minsk hosts social Hackathon to attract IT specialists to create projects useful to people. The Hackaton plans to create new projects and products in such areas as charity, ecology, education, urban environment, improving the quality of life of people, equal opportunities, etc. APB BirdLife Belarus launches a wolf blog to allow to Belarusians to observe the life of wolves in the Bielaviežskaja Pušča through the Internet. A few wolves have special GPS-collars to monitor the daily life of predators. The initiators believe that such a study may change the stereotypical attitude to wolves as a forest pest and return them a deserved place a significant element of the ecosystem. Protection of trees in Katoŭka. On 6-7 December, local residents and environmentalists defended the Katoŭka park in Minsk from municipal services, who tried to cut down trees. The confrontation came to the use of physical force. A Catholic church plans to be built in the park so 10% of the trees should be cut down. Environmentalists say deforestation is illegal, as the construction plan has not passed the necessary expertise. The City show starts the 2nd season. A preliminary acceptance of applications is opened at the project website. The City has a unique format that brings together a professional reality show and implementation of urban projects. The City-2 is a continuation of the similar project that in 2016 released 11 video episodes demonstrating how grassroots activists are trained and then implement their ideas in local communities. MFA meets with Baćkaŭščyna NGO. On 13 December, the MFA Head, Uladzimir Makiej, met with the representatives of the World Association of the Belarusians Baćkaŭščyna/Motherland, Aliena Makoŭskaja and Nina Šydloŭskaja. The sides discussed the cooperation between the MFA and the NGO to work with compatriots abroad, as well as the arrangements to the 7th Congress of the Belarusians of the World. BAJ meet Information Minister to discuss distribution of independent press. On 7 December, Belarusian Association of Journalists (BAJ) representatives had a meeting with Information Minister Lilija Ananič to discuss the burning issues of journalistic community, namely, unequal conditions for state and independent mass media, the influence of Russian media content, etc.